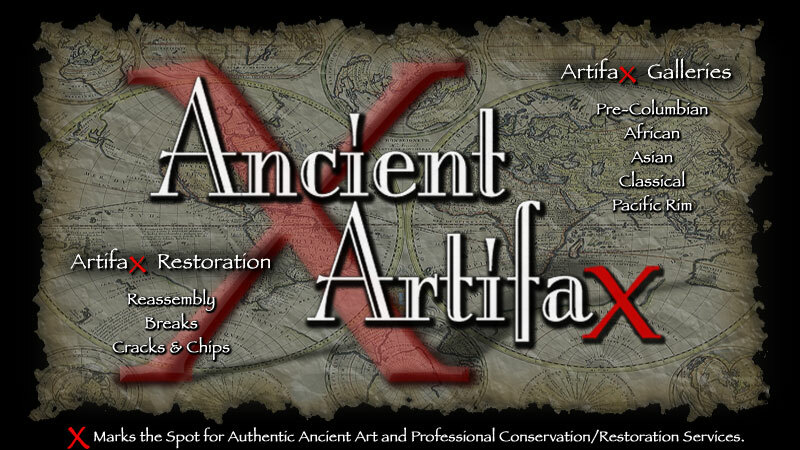 Ancient Artifax is pleased to offer fine, authentic art and artifacts from throughout the world. Browse the Galleries for a wide selection of ancient, ethnographic and tribal art from the Americas, Asia, Africa, Middle-East, and the Pacific Rim. This site will be regularly updated with new items, so check back often. Enjoy your treasure hunt! With over 20 years experience in antiquities restoration and conservation, reasonable rates and quick turn-around, I guarantee your satisfaction. Click here for details on the services I provide, FAQs and to view numerous "Before and After" photos. If you have ancient treasures in need of repair, I welcome your inquiries. In addition to artifact restoration and conservation I now offer custom made, high quality display stands. Each display stand is individually fabricated to perfectly fit your artifact(s) and show them at their best. To view a selection of styles, see the Custom Display Stands page. Great deals on authentic low-cost artifacts! Simply scroll to the bottom of the main gallery page to view a wide selection of Bargain Items from around the world. Perfect for beginner or advanced collectors. Make great gifts too! Nothing over $100. A page dedicated to Shipibo pottery has been added to this website. To view these items, see the Shipibo Artifax page. NOTE: For a limited time, all available Shipibo pottery is 20% off the listed price with the purchase of two or more items. Ancient Artifax is always interested in purchasing damaged artifacts and antiquities with adequate, acceptable provenance. I will consider artifacts from any culture in any condition. Authentic terracotta items only, please. Feel free to contact me with info and/or photos of single or multiple damaged items you wish to sell.